Patrick Francis Rice died peacefully surrounded by his loved ones, Tuesday Aug. 28. Pat was born in the Bronx New York on Dec. 20,1925, he was 92 years old. Pat was a proud World War II veteran serving in the United States Navy in the Southern Pacific from 1943-1946. As an Electrician’s Mate he was awarded several medals; The American Theater Medal, Victory Medal, Asiatic Pacific Medal Star. He was active in Guam USA, Okinawa Japan, Pearl Harbor Hawaii, Nagasaki Japan and the Korean Peninsula. Pat was awarded an honorable discharge in May of 1946. A member of “The Greatest Generation” we will always appreciate his sacrifices. Pat created the Rice Electric Construction Co., of Port Washington New York. He developed and ran Rice Electric for 30 years, until his retirement. Pat served as President of the Board of the National Electrical Contractors Association (NECA) and NECA Benefit Fund (NEBF). As well, he was a proud member of the International Brotherhood of Electrical Workers Local 25 IBEW. While growing up in Florida and Queens NY, he eventually settled with the love of his life Kathleen Rice (Lane) of Syracuse New York. They raised a fun-loving family in Port Washington, New York where they lived for over 30 years. Pat and Kay were actively engaged in several community organizations supporting environmental conservation, and community relations. As well, they were active in Our Lady of Fatima, St. Peters, and St. Francis Churches for all those years. Pat and Kay retired in Greenport Long Island as parishioners of St. Agnes Church. They loved their neighbors in and around August Lane. In their senior years Pat and Kay moved to Ridgefield Connecticut to be closer to family. 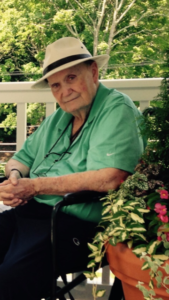 Pat had a deep and abiding love for the sea and fishing in Long Island waters. He volunteered with New York Environmental Conservation in Long Island Sound and was instrumental in gathering data back in the 1960’s that allowed the Sound to become safe again. He joined Cornell Cooperative Extension SPAT Program in Southold New York restoring oysters and shellfish to seed the bays. Some of his happiest times were Blue fishing off these shores. Patrick is pre-deceased by his Parents, Leo and Margaret Rice, his dear brother Raymond J. Rice, and loving son Joseph (Joey) John Rice. Pat is survived by his adoring wife Kathleen (Kay) Lane Rice, his seven loving children (and their spouses) Kathleen Regan (Craig Regan), Daniel Rice, Patrick F. Rice Jr. (Carla Gustin), Thomas R. Rice (Donna DeMeo), Mary M Lott (James Lott), James A. Rice, Matthew E. Rice (Kerry Buffkin). He is also survived by 16 grandchildren, Tyler Rice (Donna), Sarah Lombardi (Dave), Elliott Regan, Forrest Regan, Kieran Regan, Kathleen Lott, Mia Lott, Griffin Rice, Charlotte Rice, Darby Rice, Patrick Rice III, Brady Rice, Kelsey and Daniel, Taylor Rice, Gavin Rice. As well, four great grandchildren Amelia, Wyatt, Thomas and Payton. He was so proud of his family, but most of all his bride of 59 years, who he adored. Patrick is also survived by a sister Catherine O’Leary (William), cousins and many nieces and nephews. Calling hours will be at Fairchild and Sons Funeral Home Manhasset on Friday, Aug. 31. Mass will be Saturday, Sept. 1, at Our Lady of Fatima in Manorhaven. The family asks that in lieu of flowers, donations are made to St. Jude Children’s Research Hospital at www.Stjude.org or SPAT at www.Ccesuffolk.org. Obituary: Charles Hopkin Davis Jr.